When you search for these kinds of questions, the pages that float to the top of the algorithm tend to fall into two categories: decade-old forum threads and extremely basic, “informative” articles. Neither is especially helpful, but the “informative” articles are much more infuriating. You think they’re going to have the answer you need, but they end up being a list of basic facts in paragraph form, with no logical thread whatsoever nor any kind of human touch. You know the kind of page I mean: last copyrighted in 2009, badly designed, and so many display ads you can barely read the text. This kind of article was created, not to help people, but to rank in search engines. And now that they’ve established their search engine dominance, they aren’t going to relinquish it for anyone or anything. Any time you’re searching for niche information, it’s likely you’ll run into at least one of these articles at the very top of the search information rankings. Whether you’re gardening, doing basic home maintenance, or trying to rebuild a motorcycle, someone is out there angling to profit from your clicks. Now, there’s nothing inherently wrong with pulling together facts or lists into your own article. You just have to do it with some originality. Because here’s the deal: bots are much better at figuring out how to get people to click than you will ever be. Even if you’re one of the fastest copywriters in the world, by the time you’ve finished putting together that Top 10 list, algorithms employed by high-traffic websites will have already conducted thousands of tests to optimize their content for social media and search. For simple goals like clicks and traffic, algorithms will always win. But you have something that algorithms don’t: a voice, a perspective, the ability to synthesize your experience and empathize with your fellow humans. In You Are Not a Gadget, Jaron Lanier draws a distinction between original creation and mashups, calling them first- and second-order expression. Second-order expression, on the other hand, is a mashup of “fragmentary reactions” to an act of first-order expression. First-order expression can draw inspiration from other people’s work, but in the end, it brings something of its own to the table, it presents itself as a whole. It’s easy to understand why so many content creators revert to formulaic mashups. They’re safe; they’ve been proven to work. 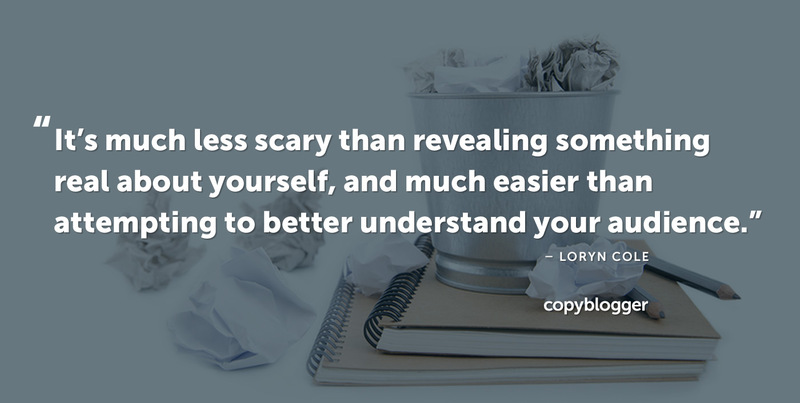 It’s much less scary than revealing something real about yourself, and much easier than attempting to better understand your audience. And maybe, for a while, you’ll see some success from a mashup. Maybe it will do well on Facebook for a week, or on Twitter for a day. Maybe it will rise to the top of the search engine results for a useful term. But now, the questions you have to answer are: How many of those people came back? How many read more than one article? How many signed up for your email list or engaged with you another way? That’s the reason so many of these sites rely on ad revenue: They don’t care if anyone ever comes back. They just need page loads. But when you’re building a sustainable business, or helping clients build one, you need to connect with your audience. You need to solve problems for them; give them answers or insight or an experience that they can’t get anywhere else. It can be scary, but when you get it right, the results are extraordinary. As we progress further into the era of social media, algorithms, and search engines, it’s worth remembering that popularity doesn’t equal quality. Success with an algorithm doesn’t equal success with the reader. And while popularity has its uses — after all, you can’t convert if nobody sees your content — it should only ever be a tool, not an end in itself. Focus instead on quality, on telling a story or presenting information as a complete whole, in a way that serves your audience, in a way that only you can. Previous article: Honoring the Life of Dr. Martin Luther King, Jr.
Great Article Loryn, Truly agree the writer and digital agency needs to break up with a mashup content creation which has no value to the reader. I am in favor of creating a useful content what has value for the human, not machine. what I believe is that, if human like your content… google algorithm will like it too. That’s certainly the ideal situation, isn’t it? Lists are fine! Numbered lists are a staple for a reason. Just make sure the content is really worthwhile on its own merits. I took a look at your site and I think you’re creating work that will be meaningful for your audience, and that helps them solve problems that are important to them. Content creators can totally have our cake and eat it too — we can created numbered list posts that are genuinely valuable, so we get the benefit of the clickworthy headline, without the audience disappointment that comes from publishing work that lacks thought or care. I definitely share your frustration with SEO-optimised drivel that doesn’t answer a question. I can’t imagine what it’d take for the algorithm to reflect what humans actually value. I hope it gets there; I think the approach of “write for humans” (which I have) is based on faith that it will. Every one of my 2,000+ word articles is another instance of that hope. My website has been around for almost 25 years and the evolution of search engines and SEO strategy has changed drastically. Meeting my reader’s needs with engaging content has been a rewarding challenge. Thanks for the input, may the mashups die along with wordstuffing.